Fast! safe and stable ! efficient.!! The delivery is fast and has been bought for the third time. The quality is good. I bought it many times. Copper SFP transceiver modules use a copper line for linking. They are suitable to use with the equipment and devices that are with copper SFP slots or ports. 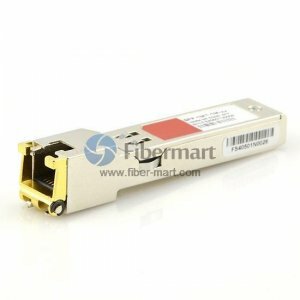 Fiber-Mart supply 100% compatible Copper SFP modules. They are built to comply with MSA (Multi-Sourcing Agreement) standards to offer a cost-effective way to add, replace or upgrade a copper Ethernet port on your 10/100/1000Base-T networking equipment. Fiber-Mart SGMII SFP transceiver is designed for Fast Ethernet applications operating date rate at 100Mbps/125Mbps. The SGMII SFP transceiver comes with build-in PHY device supporting SGMII interface. It is 100BASE-FX Small Form-Factor Pluggable (SFP) Fast Ethernet Interface Converter on Gigabit SFP Ports.